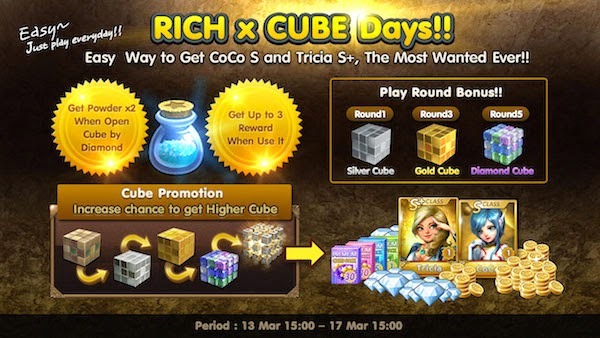 Event Minggu ini ternyata event Cube, kita akan mendapat banyak hadiah dari cube dan kesempatan mendapatkan coco ataupun karakter terbaik di get rich Tricia S+ Class. Just Play everyday ! Easy Way to Get Coco S and Tricia S, S+, The Most Wanted Ever Character!! Ancient Cube from Jackpot Reward (You will find CoCo S and Tricia S, S+ from the cube!